The Elks Most Valuable Student Scholarship is a chance for graduating seniors to win up to a $50,000 four-year scholarship to aid with the cost of a college education. Last year, Frankfort Lodge sponsored David Ma, a senior graduating from Paul Lawrence Dunbar High School in Lexington, as one of its candidates for this scholarship. David was selected among the 20 finalists that traveled to Chicago earlier this year, and ended up as the National Runner-Up, winning a $40,000 four-tear scholarship. Recently, the Elks National Foundation released a new video featuring David, who is now attending Harvard University. You can check it out above. If you’re a member of the Class of 2019, or know someone who is, you can find all the information on this year’s scholarship, as well as the online application, over on Elks.org. 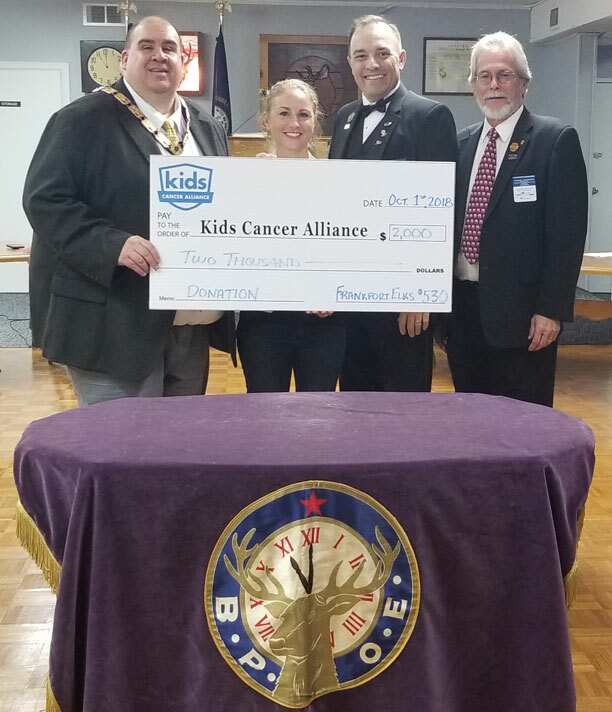 Prior to our lodge meeting on October 1, 2018, the members of the Frankfort Elks Lodge #530 presented a $2,000 donation to the Kids Cancer Alliance. The Alliance operates Camp Indian Summer, located in Shelby County. This camp lets kids with cancer build friendships and enjoy a camp experience they would otherwise not be able to have, with nurses, trained volunteers, and a staff doctor on hand to ensure every camper’s safety. The lodge’s gift will pay the full cost of attendance for two campers next summer. The funds donated represent part of the funds raised by the Lodge’s recent Charity Golf Scramble. Pictured in the photo, from left to right, are John Snyder, Exalted Ruler, Frankfort Elks #530; Shelby Russell, Executive Director, Kids Cancer Alliance; Ron Whitaker, District Deputy Grand Exalted Ruler Kentucky East District; and Charlie Cunningham, State President, Kentucky Elks Association. Don’t Miss Out on Our Oktoberfest Membership Drive! Come on down to the lodge on Friday, October 19 for our Oktoberfest Membership Drive! We’ll be featuring live music by Kentucky’s own Robby Cox. Members are encouraged to bring along a guest and show them the fun and fellowship that we enjoy at the lodge. We will have food and drink specials as well, so don’t miss out. Mark your calendars for Oktoberfest! 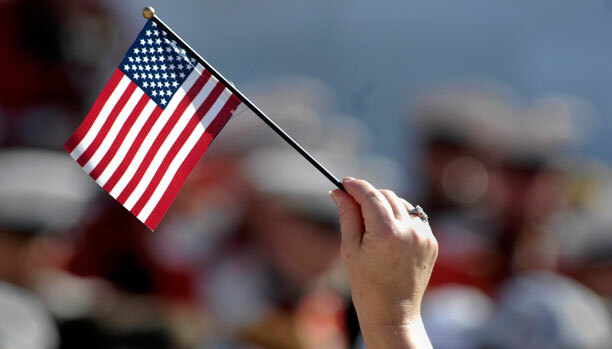 Franklin County Kids in Grades 5 – 8 Are Invited to Enter Our Americanism Essay Contest! The Americanism Committee of the Frankfort Elks Lodge #530 is sponsoring an essay contest for Franklin County students in grades 5 through 8. The theme of this year’s contest is “What Makes You Proud of America?” The contest has two separate divisions: one for grades 5 and 6, and one for grades 7 and 8. If you have any questions about the contest, you may contact the local Americanism Chairman, Mr. John Snyder, at (502) 330-3426. Our newest Life Member is Past State President Walter O. Rogers. 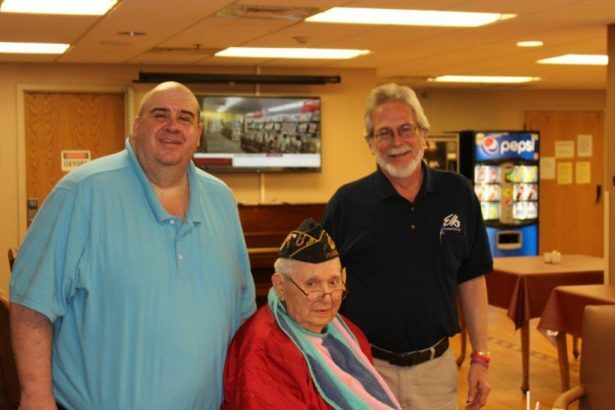 After the lodge voted him as a life member, ER John Snyder and KY State President Charlie Cunningham traveled to Thomson Hood Veterans Center in Wilmore to present W.O. with his new Life Membership card. Congratulations to W.O., and many thanks for his long years of service to our lodge and our State Association! Also recently elected to life membership were our current lodge Chaplain, Doug Sanderson. Our current KY State President, Charlie Cunningham was recently elected as an honorary Life Member as well!